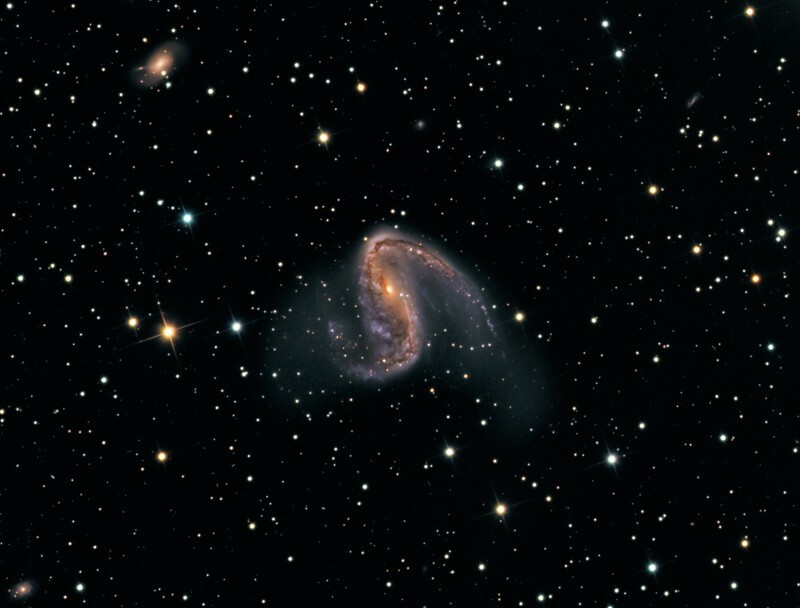 Explanation: Distorted galaxy NGC 2442 can be found in the southern constellation of the flying fish, (Piscis) Volans. Located about 50 million light-years away, the galaxy's two spiral arms extending from a pronounced central bar give it a hook-shaped appearance. This deep color image also shows the arms' obscuring dust lanes, young blue star clusters and reddish star forming regions surrounding a core of yellowish light from an older population of stars. But the star forming regions seem more concentrated along the drawn-out (right side) spiral arm. The distorted structure is likely the result of an ancient close encounter with the smaller galaxy seen near the top left of this field of view. 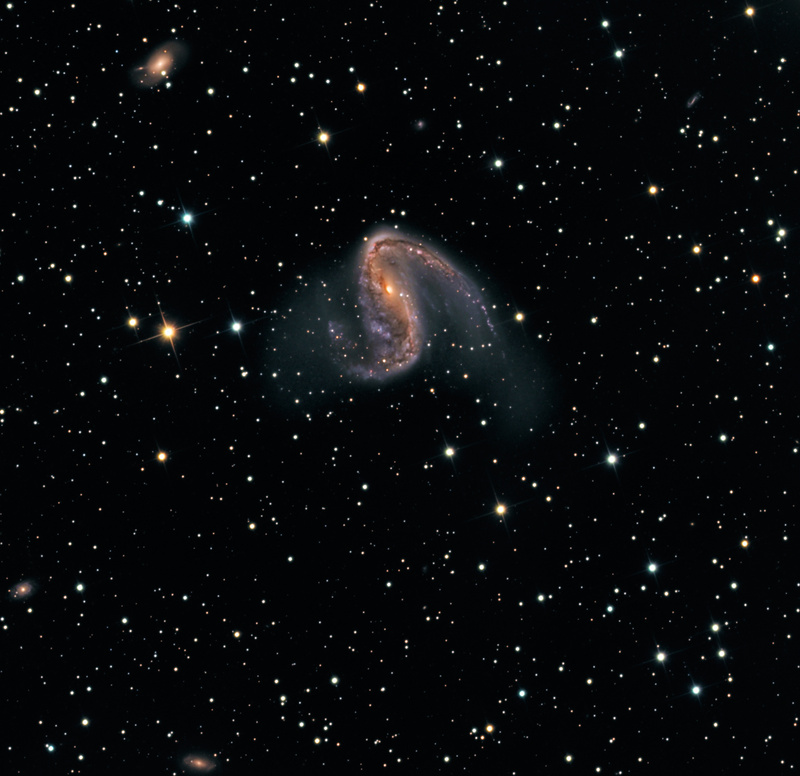 The two interacting galaxies are separated by about 150,000 light-years at the estimated distance of NGC 2442. WEST POINT, N.Y. - The Army lacrosse team kicks off a three-game home stand, Saturday, welcoming the fourth-ranked Cornell Big Red to the friendly confines of Michie Stadium for a game to be played in front of a nationally televised ESPNU audience. The Black Knights look to improve to 2-0 in homes games this season after opening the campaign with a 17-3 win over VMI on Feb. 14. Cornell plays its first road game of the season after throttling Binghamton, 18-6, last Saturday, in its season opener. Despite a goal and three assist by Army sophomore attackman Jeremy Boltus, it was top-ranked Syracuse taking a 17-6 victory over the 18th-ranked Black Knights last Friday night at the Carrier Dome. Army jumped out to a 3-1 first-quarter lead on goals by junior midfielder Andrew Maisano, Boltus and sophomore midfielderRob McCallion, but it was all Orange the rest of the way as the defending champions outscored the Black Knights, 16-3, to finish the game. Army owns a 48-21 (.696) home record dating back to the 2000 season, including a 20-7 (.741) mark over the last five years. The Black Knights are 12-16 versus ranked opponents in the last 10 years, including a 5-5 mark in the last five, when playing in front of the home crowds. Army senior attackman Jason Peyer was recently named to the 2009 Tewaaraton Trophy watch list. Annually given to the top player in collegiate lacrosse, Peyer was one of 60 names on this year’s list. A second-team Patriot League All-Conference player in 2008, the Williston Park, N.Y. native tied for the team scoring lead a year ago with 33 points. He also ranked ninth in the Patriot League with 23 goals, including three game-winning tallies. Peyer also picked up a team-best 43 ground balls during the season. Peyer opened the 2009 campaign with a career-best six goals in the Black Knights’ 17-3 victory over VMI. He scored all six tallies in the first half of the contest. Cornell opened the 2009 season with a 18-6 victory over visiting Binghamton last Saturday. Freshman Rob Pannell registered three goals and four assists, while junior Ryan Hurley added three goals and two assists to lead the Big Red. Seniors Max Seibald and Chris Finn also notched two goals and an assist each as Cornell jumped out to a 5-0 first-quarter lead and extended it to 7-1 at halftime en route to the win. Senior Kyle Harer made 10 saves in 51 minutes of work to notch a win in his first career start. Siebald and Hurley joined seniors John Glynn and Matt Moyer on the recently-announced Tewaaraton Watch list. A finalist for the award last season, Siebald garnered first-team All-America honors after scoring 33 points on 27 goals and six assists. Hurley lauded honorable mention All-America honors after totaling 46 goals and 14 assists, while Glynn was named a second-team All-America after finishing second on the team with 44 points on 18 goals and a team-best 26 assists. Moyer took home honorable-mention All-America recognition after leading the Big Red defensive corps. Army defeated VMI last week to become only the fifth lacrosse program in the country to win 700 games. In 92 seasons, the Black Knights are the owners of a 700-322-7 record since defeating Steven’s Tech, 3-1, in the program’s first outing in 1907. Army, along with Saturday’s opponent Cornell, is one of only eight teams with more than 650 wins. Army senior midfielder Sean Reppard was named the Patriot League Defensive Player of the Week for his efforts in Army’s season-opening victory over VMI. The Black Knights’ top faceoff specialist won 9 of 11 faceoffs on the day, including five straight to start the game, while picking up seven ground balls during the outing. Army was ranked No. 22 in the 2009 Inside Lacrosse preseason poll. Seven teams on the Black Knights schedule joined them on the list, including three others from the Patriot League. After squaring off with No. 2 Syracuse on Friday, Army will see No. 4 Cornell, No. 7 Duke, No. 10 Navy, No. 15 Hofstra, No. 17 Colgate and No. 18 Bucknell, during the season. When Army sophomore Tom Palesky started in goal for the Black Knights last Saturday versus VMI, it marked the first game since March 12, 2005 versus Cornell that a goalie other than Adam Fullerton had his name announced in the Army starting lineup. Fullerton capped his stellar career with third-team All-America honors and his second-straight Patriot League Goalkeeper of the Year award in 2008 and was the first goalie taken in the National Lacrosse League Draft by the Rochester Rattlers with the 28th overall pick. Fullerton was commissioned a 2nd Lieutenant in the U.S. Army is currently serving as the team’s athletic intern at West Point. When freshmen attackman James MacGibbon and freshman midfielder Sean O'Sullivan each scored a goal in Army’s season-opening victory over VMI, there may have been two other people in attendance more excited than they were about their first collegiate tallies. James’ father Kevin MacGibbon (USMA ‘80) was a two-time All-America goalie for the Black Knights in 1979-80, while Sean’s dad, Patrick O’Sullivan (USMA ‘85) was a two-time All-America midfielder for Army in 1983 and 1985. Army sophomore midfielder Rob McCallion picked up this season right where he left off at the end of his plebe campaign a year ago. Tied for the team lead with 33 points, he was the only Black Knight to score at least one point in every single game in 2008. He hit the ground running in 2009 with four points on two goals and two assists versus VMI, and a goal at Syracuse to extend his scoring streak to 17 games, which is tied for the 10th longest streak in the nation among active players. Army’s win over VMI on Feb. 14 marked the earliest season opener that the Black Knight lacrosse team has played since its inaugural season in 1907. The game beat the previous mark set last year, also opposite VMI, by two days. Army will continue its three-game home stand next week, hosting first-time opponent Bryant on Wednesday (March 4) in a 4:00 p.m. matinee, before welcoming service academy rival Air Force to Michie Stadium on Saturday (March 7) for a 12:00 p.m. faceoff. Tuesday will feature a clash of old friends, as Army head coach Joe Alberici was an assistant for nine years at Duke for current Bryant head coach Mike Pressler. The 2009 Army lacrosse team sports three sets of brothers. Senior captain Kevin LoRusso, who followed in the footsteps of older brother Nick LoRusso ‘07, greeted his two younger brothers, Brian and Larry LoRusso to the squad this season as plebes. Sophomore Bill Henderson will have his younger brother, freshman Tim Henderson, to follow him around for the next three years, while sophomore twin brothers Tom and Nick Palesky joined the team last season. Army head coach Joe Alberici was named an assistant coach for the U.S. National Lacrosse Team that will compete at the 2010 World Lacrosse Championships in Manchester, England. Alberici will join Philadelphia Barrage head coach Tony Resch and Stony Brook University head coach Rick Sowell on the team’s staff, put together by Bryant University head coach Mike Pressler, who was selected head coach of the all-star squad last summer. Sophomore attackman Jeremy Boltus’ older brother, Jason, was invited to the upcoming NFL Combine after an outstanding career at Division III Hartwick (N.Y.) College over the last four years. The 2007 Melberger Award winner as the top player in the nation, Boltus amassed a Division III record 14,231 total yards over during his career and set school records in career TD passes (134) and passing yards (13,276), As a senior, he led the nation in total offense (415.5 ypg), points responsible (28.8 ppg), total passing yards (3,943) and passing yards per game (394.3) in 2008. For the first time ever, Army lacrosse fans not able to be at Michie Stadium in person will have the opportunity to watch every home game live via Knight Vision on www.goARMYsports.com in 2009. In addition, all nine home games, as well as the Army/Navy game in Baltimore, will also be broadcast live on the radio in the Hudson Valley on 1390 AM WEOK and 1340 AM WALL. Fourth-year Army head coach Joe Alberici was named the Patriot League Coach of the Year last season after guiding the Black Knights to a share of the regular season conference championship and program’s first-ever top seed for the Patriot League Tournament. After being picked to finished fourth in the preseason conference poll, Alberici led Army to a 9-6 record, including a 5-1 final conference record, along with a pair of victories over nationally ranked opponents. The Black Knights picked up a last-second 8-7 win at then 12th- ranked Hofstra, before upsetting sixth-ranked Navy at Michie Stadium. The Auburn, N.Y. native joined Army coaching legend Jack Emmer, who won the award in 1992 and 1998, on the list of Black Knight skippers to win the honor. Five Army players were named to the Patriot League All-Conference team last spring. Current senior captain midfielder Kevin LoRusso was honored as a first-team selection, while classmate Jason Peyer was named a second-team attackman. Three members of the Class of 2008 also lauded all-conference honors as goalkeeper Adam Fullerton, and defenseman Jay Larson joined LoRusso on the first team while defenseman Craig Massie landed on the second-team. Army senior defenseman Scott Rosenshein was named the 2008 Patriot League Scholar Athlete of the Year. The Chemical Engineering major is the owner of a 3.99 cumulative grade-point average and is a seven-time Dean’s List selection. The Montclair, N.J. native garnered his third Patriot League Academic Honor Roll nod as well in 2008. Ranked 28th out of over 1,000 cadets in the class of 2009, Rosenshein wears the #48 in honor of his late grandfather, LTG Willard Scott, who graduated from West Point in 1948 and went on to a distinguished military career that included serving as Superintendent (the equivalent of being president of a civilian university) from 1981-1986. 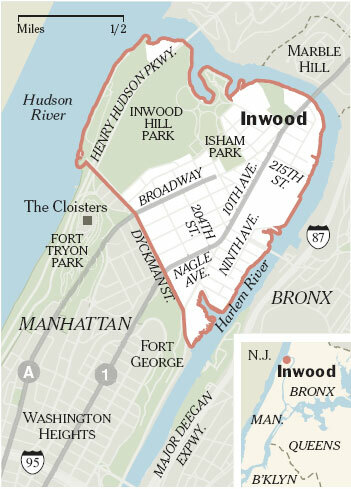 APARTMENT shoppers often react reflexively to the mention of the name Inwood: too far away, they say. That was the initial reaction of Constance Parten and her partner, Merryn Johns, when a friend mentioned the area to them last year. Ms. Parten, a native Texan who works as a producer for CNBC.com, and Ms. Johns, the editor of LOTL, an Australian magazine geared toward lesbians, were renting at 96th Street and Lexington Avenue. But further investigation revealed that Inwood would satisfy their desire for both a Manhattan home and a connection to the outdoors. Inwood lays claim to some of the borough’s only remaining natural forest and salt marsh. “You feel a sense of history that you don’t necessarily find elsewhere in Manhattan,” said Ms. Parten, 40. Last July, she and Ms. Johns, 43, closed on a one-bedroom one-bath co-op in Park Terrace Gardens, a five-building complex with a roof deck, private gardens and free Internet access. They paid several thousand less than the $350,000 list price. Their apartment is about three blocks from the No. 1 train, and the same distance in the other direction to the 196-acre Inwood Hill Park. Ms. Parten says she can hear crickets chirping in the summer, and she has not yet been woken by a siren. Still, Inwood has its noisier pockets. One stretch in particular, along Dyckman Street close to the Hudson River, is a popular destination for people to relax and blast music from their cars, said Ebenezer Smith, the district manager of Community Board 12. Complaints last summer led the police to increase their attention to the area, he said. Hispanic residents make up 74 percent of Inwood’s people, according to census data; the area is known for its Dominican enclave. Puerto Ricans, Mexicans, and natives and descendants of other countries also contribute to a Latin culture that is everywhere in evidence, from the music playing in food stores to the plantains, queso blanco and other products on their shelves. Though there were those who demurred, a number of residents described the neighborhood as a hidden gem — as if an area with more than 41,000 residents could be kept secret. Inwood, the northernmost neighborhood on the island of Manhattan, is bordered by Washington Heights to the south at Dyckman Street, the Hudson River to the west, and the Harlem River to the north and east. From the sidewalk, it is possible to look up and down long avenues lined with six-story buildings of variously colored brick facades, some dating to the Art Deco period. Although there are a few condominiums, most properties for sale are co-ops. There are also a few free-standing houses along Park Terrace West and 217th Street. The vast majority of residents — 94 percent — rent their homes, according to census data. The Dyckman Houses, a City Housing Authority development with seven 14-story buildings, is bounded by Dyckman Avenue, 204th Street, Nagle Avenue and 10th Avenue. Dominican restaurants, bodegas and beauty parlors line 10th Avenue beneath the green elevated rails of the No. 1 train, as well as the main commercial stretches of Broadway, 207th Street and Dyckman Street, where they mingle with banks and clothing stores. Mr. Smith estimated that on weekends half of the people who browse these businesses come from other neighborhoods, seeking Inwood’s distinctive Dominican flavor. The Dominican presence is concentrated east of Broadway, Mr. Smith said, but the more affluent area to the west is also home to many Irish, Inwood’s once dominant demographic. In contrast to the greenery of Inwood’s western section, its eastern waterfront is more industrial. A huge yellow-brick building on Ninth Avenue at 215th Street, once an incinerator, is a garage for city garbage trucks and street sweepers. A block north, city buses retire to the Kingsbridge Bus Depot. The rental market is propitious for tenants right now; similarly, in co-op buildings, prices have dropped and the pace of sales has slowed. Apartments tend to remain on the market for three to six months, a month or so longer than they would have last year, brokers say. Rentals are more plentiful east of Broadway. Andrew Shell, the owner of the A .N. Shell Realty Group, said, “Right now some of them are offering you not one but two months’ free rent.” One-bedroom rentals near Inwood Hill Park start around $1,100, two-bedrooms around $1,500, Mr. Shell said, adding that east of Broadway, rents generally decrease about 25 percent. Elementary schools include Public School 98 Shorac Kappock, on West 212th Street near 10th Avenue, for prekindergarten through Grade 4. It enrolls 618 students, 97 percent Hispanic. Last year, 45 percent of fourth-graders met state standards in English and 74 percent in math, versus 61 and 80 citywide. Among area middle schools is Junior High School 52 Inwood, on Academy Street near Broadway, for Grades 5 through 8. Last year, 32 percent of eighth-graders met state standards in English and 45 percent in math, versus 43 and 60 citywide. Many older students attend Gregorio Luperon High School for Science and Mathematics, on 165th Street at Amsterdam Avenue. Its student body is mostly Hispanic; it is geared toward recent arrivals in the United States. SAT averages last year were 326 in reading, 349 in math and 307 in writing, versus 438, 460, and 433 citywide. Inwood’s western portion is occupied by the vast Inwood Hill Park. In addition to athletic fields and playgrounds, it has kayak and canoe launch sites along the Hudson River and early morning “watches” for bald eagles. The nearby Inwood Canoe Club has a free kayaking program on Sundays in the summer. And each summer the Inwood Shakespeare Festival is held in the park. The much smaller Isham Park sits adjacent to Inwood Hill Park atop a steep hill. Offering green space and long views down the avenues, it was in the 19th century the home of William B. Isham, a leather merchant. Restaurants have sprung up in the last two or three years near Inwood Hill Park, like the Park Terrace Bistro, on Broadway near Isham Street, and the Indian Road Café and Market, at 218th Street, which has weekly live music, trivia night and a knitting group. A restaurant row seems to be developing on Dyckman between Seaman and Payson Avenues. An increasingly lively stretch, it has generated noise complaints from residents. The A train stops at Dyckman and 207th Streets, for a 30-minute trip to 42nd Street, and the elevated No. 1 train stops at Dyckman Street and Nagle Avenue, and 207th and 215th Streets at 10th Avenue. The 100, 7, and 20 buses travel along Broadway, and the 12 runs along Isham and 207th Streets. Inwood Hill Park is one of several sites historically associated with Peter Minuit’s purchase of Manhattan from the Lenape Indians. While Inwood is the northernmost area on Manhattan Island, the northernmost in the borough itself is Marble Hill. Explanation: Tracking through the constellation Leo on February 23rd, bright planet Saturn and Comet Lulin were both near opposition -- opposite the Sun in planet Earth's sky. They also passed within only 2 degrees of each other creating a dramaticcelestial photo-op. 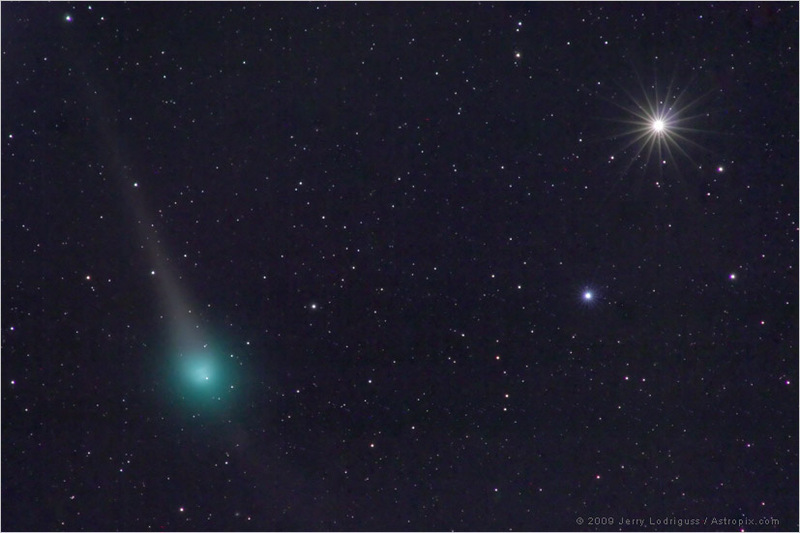 Comet Lulin was near it's closest approach to planet Earth at the time, at a distance of some 61 million kilometers, but was orbiting in the opposite direction. As a result it swept remarkably rapidly across the background of stars. This telephoto image captures both bright Saturn and greenish Lulin in the same field in a scene not too different from binocular views. Don't recognize ringed Saturn? The rings are presently tilted nearly edge-on to our view and the brighter planet is overexposed to record details of the fainter comet. At the upper right, Saturn is marked by multiple diffraction spikes created by the aperture blades in the telephoto lens. Legal Issues: As this site depends on visitor price updates, New York Gas Prices is not responsible for information inaccuracies, inconsistencies or errors. New York Gas Prices reserves the right to make changes to any of the site content at any time without notice.